Hello! If you are here because of the KARE 11 or MPR segment, welcome! If you’re wondering about what the smart phone photography technique I was talking about, it’s known as digiscoping or phone scoping. It’s a way to use your smartphone with a spotting scope to take pictures and videos of birds and wildlife. You can learn more about the technique and the kit I use here. The case for my phone that I’m writing about is from a company called PhoneSkope. If you’re curious about “the bog” I referenced, that is Sax Zim Bog—a birding hot spot in Minnesota, especially in winter. You can find tons of great information at the Friends of Sax Zim Bog page. If you’ve never been, it’s best to hire a guide or consider going to the festival. The bog is large and without a strategy you can spend a lot of time driving without seeing any birds and wondering where to pee. The bog is great birding year round, but there some birds that are easier to see in winter or can only be found there in winter. 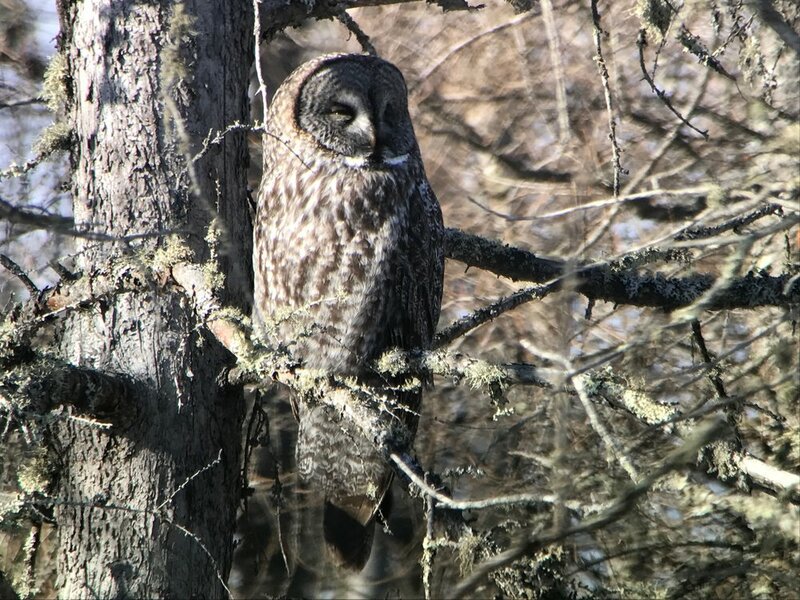 Target species for birders include (but is certainly not limited to) great gray owl, northern hawk owl, Canada jay, pine grosbeak, evening grosbeak, common redpolls, hoary redpolls, snowy owls, black-billed magpie and boreal chickadee. Several areas host bird feeders, some on private land, some on public. Friends of SZ has a great map pointing out the feeding stations. Some of the birds are after seed and others are after meat and fat in the form of chunks of venison. Canada Jay perched on meat mountain (a deer torso) at Sax Zim bog. Dozens of black-capped chickadees will also come in for this. Note video below. 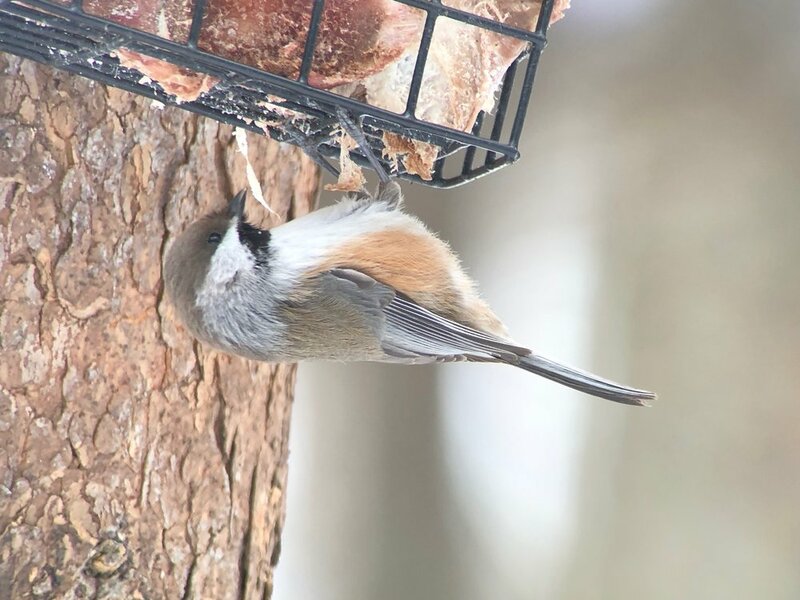 Boreal chickadee on a suet feeder filled with deer chunks. I told my friends Gayle and Anne who dragged me out of my apartment for this day trip to listen for a “chick-a--shnee” sound instead of a “chick-a-dee-dee-dee” sounds. Among all of the black-capped chickadees in the bog is the browner boreal chickadee. We heard the bird but only caught barely a glimpse. We waited as long as we could but got the point where we needed to take the boardwalk back to the bathrooms. We carefully made our way back, keeping our eyes down to watch for icy patches when we heard a loud “CHICK-A-SHNEE!” There, about three feet from us on a feeder was the boreal chickadee. It was almost as if it was trying to tell us not to miss it. We got good long looks and I had to back up down the trail so I could get a photo with my scope. 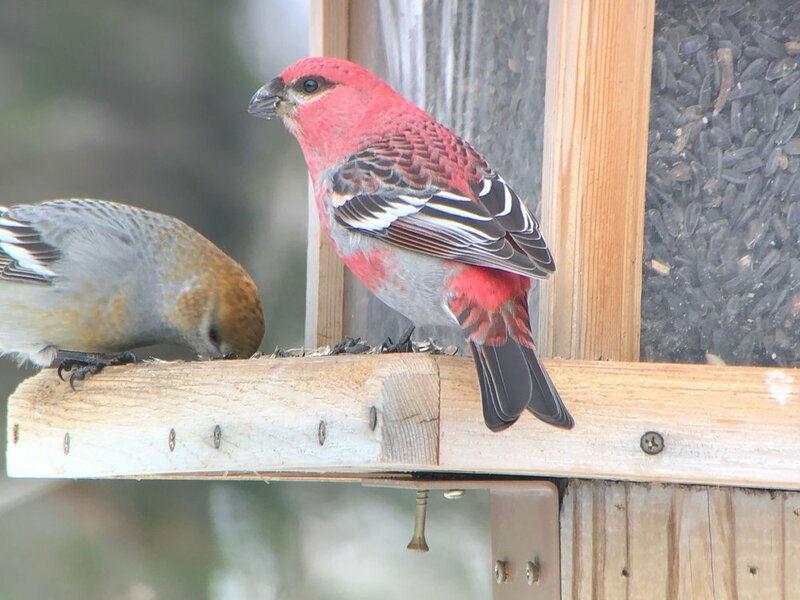 Colorful pine grosbeaks are in big numbers this year and easy to get at the bog. I didn’t manage to get a photo on Monday, but here are evening grosbeaks from last year. They kind of look like a goldfinch on steroids. Again not a photo from Monday, it was too dark to get a picture of the great gray we saw. However, I took this picture a year ago in the same spot.